Since Thanksgiving is still sitting on my thighs I have been craving fresh, light salads. This did the trick and the beets looked beautiful against the green of the napa cabbage. Very refreshing indeed! In a dry skillet toast almonds over medium heat until they become fragrant and golden, about 5 minutes. Set toasted almonds aside. In the same skillet cook pancetta until browned, about 10 minutes. Transfer pancetta to paper towel to soak up excess grease from frying. In a small mixing bowl add all dressing ingredients and combine throughly. In a separate mixing bowl combine cabbage and dressing. Refrigerate cabbage, and dressing for an hour or two. Remove from refrigerator and stir in almonds. 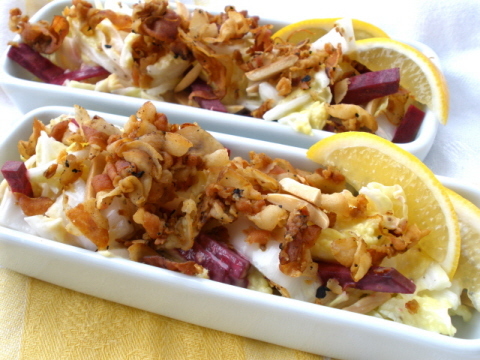 Divide salad among 4 plates and garnish with beet and pancetta. I tried to make my own mayonnaise and it was a disaster. Sorry, this I did have to buy prepared. Please do let me know if anyone has any suggestions for homemade mayonnaise. Mine didn't thicken and tasted worse than it looked.